I'm joining up with One Year and Beyond this week and the topic is loving your post-pregnancy body. Back in April, I wrote a post on this topic called "Body Image After Baby" and this is the perfect time to revisit the discussion. As E is getting older, I'm feeling like I have my body "back". After a beautiful summer of playing outside and two half marathons, I'm in better shape than I was pre-baby. I feel great! Now here's the kicker... We want more babies. As many as God chooses to bless us with. With more babies comes more pregnancy and more body image battles. E is now 19 months old and he is gearing up to be a big brother! Yes, God has graciously blessed us with Baby #2! It's early in the pregnancy but this is something we want to share right away. Life begins at conception and this is our baby - E's little brother or sister - no matter how old he or she is. Bring on the early preggo bloat and that awkward "is she pregnant or just eating too much?" stage. We're growing a baby here! Throughout this pregnancy, I want to keep a godly perspective and be always thankful remembering how fervently we have been praying for this child! 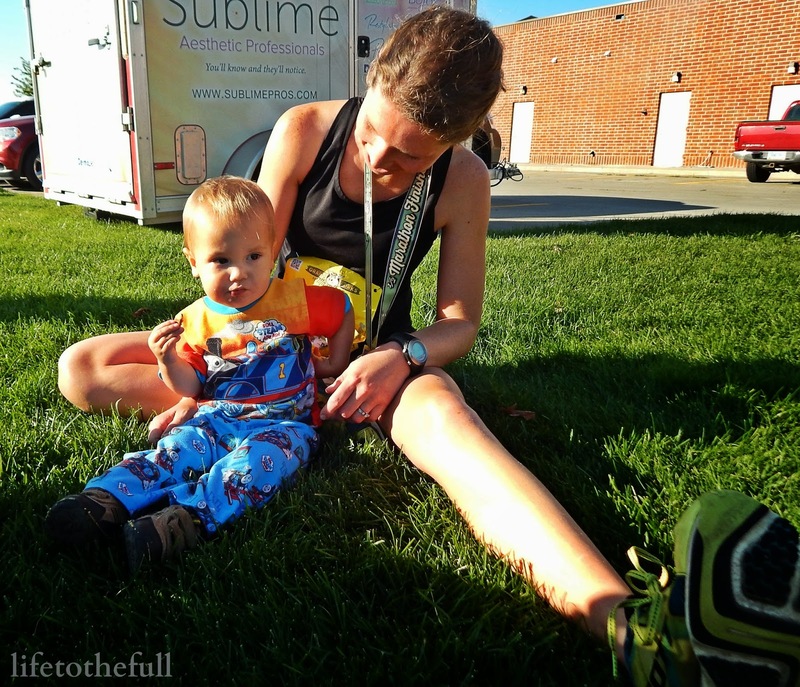 Here are a few thoughts I shared in a past post about body image after baby. Whether you are expecting your first one or a mom to many, I pray that this can be encouragement to you. Be Thankful. Health is something that is so easily taken for granted until you don't have it anymore. Pregnancy can be easily taken for granted, too! Being able to grow a life is a (sometimes very uncomfortable) blessing from the Lord, not a burden. I'm reminding myself to be thankful for the blessing of carrying our son, for each run, for each day that I can chase our toddler, and for the health God has given me. I would love if the Lord blessed us with many more babies and I know my body will change drastically with each one! I don't want to waste the rest of my life feeling self-conscious and discouraged. Don't Compare. Every woman's body is so different that you can't compare your postpartum progress to other moms or to your pre-baby body! Reading about other mom's postpartum fitness journeys and goals can be encouraging, but it can also drag you into a comparison trap. Just remember that even those super fit moms are human, too! It's very likely that she has those days of feeling bloated and discouraged just like every other woman. Take Care of Yourself. No matter how busy you are, it is important to set aside time to exercise! If regular exercise seems daunting, start with 30 minutes at least 3 to 5 days a week. It will make such a difference! Being able to keep up with our kids is enough motivation to exercise for me. I want to be able to jump on the trampoline, play soccer, and go for family walks/runs when they are older! What helps you to keep a positive body image? Linking up at Mommy Moments and One Year and Beyond. Whoooo hoooooo I'm going to be an Auntie again!!!!!!!!!!!! SO EXCITED!!! Praise God!! Ahhhh so excited to someday join you on this journey to motherhood - all in His timing :) So grateful to have you in my life though - your vulnerability is wonderful! Thanks for sharing this! Congrats!!!!!!!!!!!!!!!!!!!!!!!!!!!!!!!!! I'm so happy for you!! How far along are you? Awesome post by the way! I say the same thing of being thankful, don't compare (even though it's SO hard not to do!) and taking care of yourself. We need to invest in ourselves in order to be our best self for our families. Thank you, Melissa!!! I am 6 weeks along right now :) We're due for June 6, 2015! Oh my goodness, CONGRATS!! What exciting news!! I must admit that the idea of having another baby is becoming more and more appealing, but it's also intimidating to think of all the work I put into getting my body back. It will all be flushed away. But of course I'll do it because our babes are SO worth it!! I seriously think we would have so many LESS body image issues if there was no comparing in this world... which is totally society's fault. All the models, actresses, etc. If I could afford a personal trainer and chef I would be a freakin' babe after giving birth as well. But that's not realistic for 99% of the population, ha! It's not even fair to compare to other bloggers/IG friends. We are made and built differently and that is what makes us so individually beautiful!! I agree, Courtney! Comparing is totally a joy-stealer!